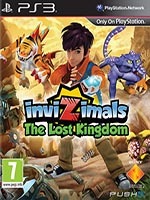 For fans of action adventure, Invizimals: The Lost Kingdom is a brand new game which allows young explorers to enter the world of the Invizimals for the very first time. Developed exclusively for the PS3 by Magenta Software, players will discover The Lost Kingdom through the eyes of Hiro, a young explorer who uncovers a magical portal that teleports you into a fantastical new world. With the opportunity to transform into one of your all-time favourite Invizimals, players must use the Invizimals unique abilities to defeat a powerful robot army that is attacking The Lost Kingdom and solve puzzles as you journey across six exotic worlds by land, air and sea.